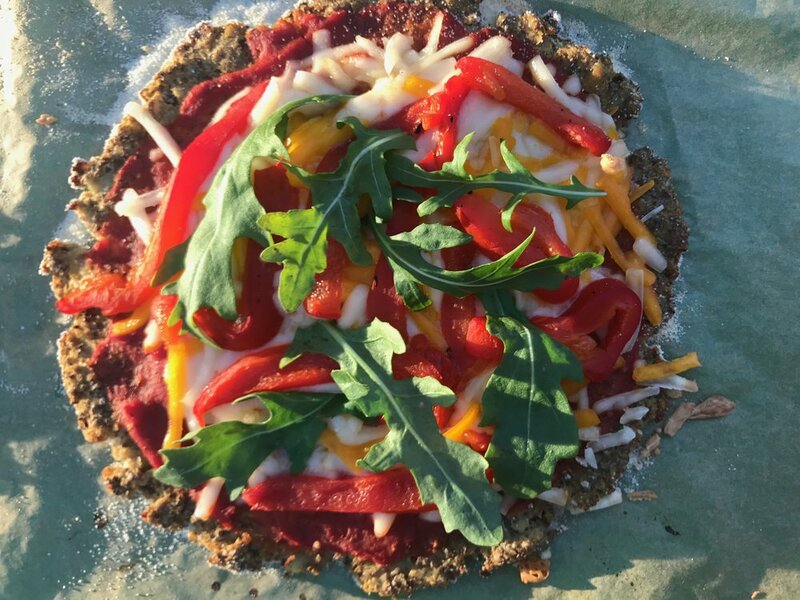 Cauliflower-Crust (Do I Have to Call it) Pizza? Along with my hang-ups with processed substitutions, I feel weird calling something by a name it isn’t. Especially when it is one of my favorite foods, pizza. Probably my east coast upbringing and sensibilities, but I have definite opinions from childhood on what are classic pizzas. But, as I got older and traveled, I recognized the value of letting some of that go and seeing American regional and world varieties that are no less authentic than my favorites. One of the many reasons I have so much respect for Tony Gemignani. His book The Pizza Bible breaks it down and the recipes are as authentic as can be. Despite the fact that I am not ready to call this cauliflower crusted round a pizza, I will say it works really well with Tony’s Basic Tomato Sauce. Cut the cauliflower into florets, leaving the tender stems. Working in batches, as needed pulse in a food processor until the texture of couscous. You will have about 6 cups. Line a colander with a linen towel. Lift the cauliflower in the towel and squeeze out the excess water. I like to squeeze in this towel, then put in a dry towel and squeeze again. Transfer the cauliflower to a large bowl and add the remaining crust ingredients. Line a baking sheet with parchment paper and brush with coconut oil. For two medium pizzas, divide the mixture in half, mounding on the lined baking sheet, leaving room between, and press into two 8- to 9-inch circles. For four individual pizzas, divide the mixture into quarters, mounding on the lined baking sheet, leaving room between, and press into four 4- to 5-inch circles. Bake until the crust is slightly firm to the touch and looks dry, 20-30 minutes, depending on the moisture in the mixture. I found the crusts can be removed from the oven at this point and held at room temperature for about 2 hours. (For us that’s the time we needed to go over to the schoolyard and run around for a while.) Before adding the topping, I put the crusts back in the oven for 5 to 10 minutes to warm up. Meanwhile, make the sauce. If you have an immersion (stick) blender, put the tomatoes, tomato paste, oregano, and salt in a deep bowl. Or put the ingredients in a traditional blender. Blend until smooth. Stir in the olive oil and the basil, if using. Remove the crusts from the oven. Spoon some sauce on each and spread over the top, leaving a ¼-inch border around the edges. Sprinkle with the cheese and then add any topping of choice. (If adding a green like arugula, do so after baking.) Return to the oven and bake until warmed through and the cheese is melted, 12 to 15 minutes more. Transfer to a cutting board and cut into wedges. My daughter has asked me to “tell the story of the night of the fires” hundreds of times. Not sure why. Maybe she takes comfort in the before and after. I am no stranger to gale force winds. I grew up knowing what heavy winds are all about. Hurricane season and Nor’easters were a regular part of East coast beach town weather patterns and my family’s life. I can still shudder thinking about the two-block walk to my childhood home’s front porch in the winter straight into the easterly wind off of the ocean from where the bus left me off. The Northern California winds that picked up during the later evening hours of October 8, 2017 were strangely familiar and intense, but with one huge difference. The winds that hurled into Sonoma County were bone dry. Our family visited with friends for dinner. It was a terrific fall afternoon that leisurely made its way to nightfall. We all sat outside, ate and drank with our kids playing and running around. After a great time, we went in the house to help tidy up and collect our things to go home. It was Sunday, a school night. As we headed out, we all commented on the wind. My husband, Rocky, hollered at me. “Get in the truck!” My reaction was, what the heck is wrong with him?! But, once we got in, I could see what was worrying him. The power lines were swinging and arching overhead, uncomfortably quick and high. He was concerned one was going to break free and land either on us or in front of us. We sped home and made our way in the house. Our daughter, Aurora, was over-stimulated to say the least. And the wind was understandably disconcerting to her. It took some doing but she went to sleep. We went to bed not too long after and watched a video on my iPad. Totally restless too, I think we both sort of slept, but in and out. I couldn’t help looking out the windows from our bed. The trees looked like the palms you see on The Weather Channel during a tropical storm coming in through Florida. At one point, I was sure I saw one of my daughter’s flip-flops caught up in a mini wind tunnel. The phone rang sometime after 11:00 pm. Our friend Sarah called to let us know there was fire glow on the horizon, and wanted to know if we could see it more clearly since we were closer. Rocky got in his truck to try to find out what was going on. I got out the candles. At this point the thought of leaving seemed like overkill to me. The power was still on. I went to the front window and saw the orange glow. I stood looking for Rocky’s truck to pull back in the driveway. Another neighbor’s truck went by, seemingly to see what was up too. Some worry crept in. When Rocky came back he said there was a huge fire rolling through Kenwood just a few blocks away. He also said we needed to get some things together and be prepared to leave as he put his laptop and camera by the front door. We went through a quick list of people I would call to make sure they were awake. Most friends I left messages for. He was off and running again to go wake up our neighbor’s directly across the street. I saw the lights go on and them teetering around. They are in their eighties and do not do anything quickly. I couldn’t stop thinking about other family friends we had in the general area as I lit the candles and quickly gathered some things. Rocky called Sarah back to let her know we were packing up to be ready to go, and they should do the same. The power went out, but I had lit the candles. I pulled out the lockbox with important papers and some flash drives. The box was a wedding gift from my very practical father. Otherwise I’m not sure they would have all been together. I then went back and got my laptop, iPad, and bag with wallet and glasses before heading into Aurora’s room to grab her a spare outfit. Deacon, our one in a million dog, was on the floor at the foot of her bed. A notable first. As much as he loves her, he always slept on his own bed in his own happy corner of the house. He knew something was different, and the visual of him near her would be a continuous theme during our time away from Kenwood. I whispered in her ear that I needed to get her dressed and that we might need to leave. She was annoyed, but let me wrestle her into clothes. She fell back asleep. I pulled on a sweatshirt and changed from boxer shorts to a pair of yoga pants. Didn’t even think to put on underwear or a bra. I met my husband at the door. He went to get my car keys off of their hook. They weren’t there. Seriously? I couldn’t find them anywhere. Thankfully there was an easy to find spare. “OK, we have to go.” Rocky said. “You get Deacon. I’ll get Aurora, then the stuff. Once I do, you pull in across the street to load up Skip and Bev. I’m going to make sure people are awake down the street. And, I’ll meet you at the strawberry field. There aren’t any trees there.” I didn’t freak out, but my heart was definitely racing. I have always been able to focus and stay clear-headed when I have to. And, there is no question Rocky is the guy you want around in a time of a crisis. He is a force to be reckoned with and takes charge without even needing to ask. It’s one of the qualities I love the most about him. It can also drive me a little crazy, but tonight, I was glad for the clearly identified path, and knew there was no arguing with him. That was the plan. Aurora was very upset, but followed direction. We got the eighty-somethings and their necessities loaded up. I sat with my hands on the wheel, took a deep breath, and gave Rocky a kiss through my window. I needed a second’s pause. Cars of our neighbors were passing by. A sheriff’s car turned the corner, bullhorn bellowing, “This is a mandatory evacuation.” I remember very clearly putting my foot on the brake and shifting the car into drive. I pulled out, turned a few corners and made our way up to Highway 12 and the strawberry field. It was a good idea, but no surprise the chains that are always there after hours were across the driveways. Now what? I pulled in and around in the Kunde Family driveway and tried to call Rocky. No answer. All eyes were on me. Aurora steadily and quietly sobbing, but Bev holding her hand. It was either go right or left. Right into Santa Rosa or left into Sonoma, fire glow visible in both directions. I will never be sure why, but I chose left. When we went by Beltane Ranch there was fire on both sides of 12. Aurora knew where we were and whimpered, “Mommy that’s where Carlos’s house is. I hope he and Drakey are OK.” There was no way of telling what was burning, the smoke had completely engulfed the property. I just kept driving. A text from Sarah’s husband said, “we are in Sonoma and all are welcome”. I replied with the rundown of who was in my car and “are you sure”. “Yes”. That was all I needed. We had a destination. Rocky called and I texted him the address. When we arrived, Deacon was allowed in without a blink and we all found spots. Aurora needed some serious soothing to get back to sleep. Deacon curled next to the couch, keeping watch on his girl. The television was on in the other room. Everyone huddled and eyes were glued. There were continuous headshakes and small gasps. As the night progressed we learned there were more than just our fires. Sonoma and Napa counties were ablaze in so many locations. New evacuations kept being posted. Would this area in Sonoma be next? The texts came in throughout the night and early morning hours. Gratefully, fairly early on we learned that the guests and kids made it off the ranch at Beltane while others stayed to fight the fire, and that most of the historic buildings had been spared. But, the damage was extensive and they were still hard at work. Friends were all reporting in on where they were. Some already knew their homes were lost. Then there were the rumors. Chateau St. Jean was gone, the Kenwood gas station had blown up, and the elementary school, which is a block from our home, was on fire. Rocky said he needed to go back and check things out in Kenwood. I knew he would be smart. He had been a fire fighter. I also knew he wouldn’t leave again, unless he absolutely had to. And, he didn’t. He felt like he had a bigger job to do in town and I respected that, but I had resentment for being separated. All decisions about what to do outside of our home were now mine. Our hosts could not have been more gracious. We invaded their home. Yet, I watched the grandfather walk with his cane to steal away for a little while and fall asleep sitting up in a chair. He gave up his bed, all beds, and the couches to guests. They went out early in the morning to get coffees and made us all breakfast. They genuinely meant it when they said we could stay as long as we needed to, but I knew we had to go. If the fires kept coming, I did not want to be sitting on Broadway waiting to get out of Sonoma. I talked to Skip and Bev and told them my plan was to go stay with my cousin and her family in Oakland. I suggested they choose if they wanted to go to Petaluma or San Rafael to be with their family. I would drive them there on our way to the east bay. Decision made and it felt right. We were in my car within the hour. Skip treated us to In-N-Out. I brought them to where they belonged with family, and me and my most precious cargo, Aurora and Deacon, were back on the road. For the majority of the ten days we were evacuated we were in Oakland. Another almost indescribable level of gratitude goes to my family (and Rocky’s in Santa Cruz) who opened up their home, hearts, and refrigerators to us. Ten days of Target runs for clothes and toiletries, way more screen time than I ever allow, filling up our days with activities that should have been fun, but weren’t, and wondering about Daddy. We talked to him occasionally, but not as often as we would have liked. We were all on high alert. For me it was emotionally consuming. Keeping it together for a very confused and sad 5-year old while I had my own inner turmoil was taxing. I have never been so conflicted and had a very short fuse. I was immeasurably proud of Rocky for helping to save a friend’s home in neighboring Glen Ellen, doing what needed to be done in Kenwood, including clearing debris and watering down many yards and roofs, working tirelessly in the schoolyard, feeding our neighbor’s chickens and the bunny locked in the hutch at school. Priority number one for him was the school. He knew if the school went that would be a devastating blow to the kids and our entire community. I was happy he had gone back and had the opportunity to gather some more of our belongings. I knew he would leave if the fire got too close. And I was OK knowing we had our most important material possessions, but that felt less and less important with each passing day. I had waves of anger. Angry for being the one who had to manage it all, listen to her cry in her sleep, and explain sometimes hourly why he wasn’t with us. But, in the end, I know we all did exactly what we should have done during that time. Nine days later the mandatory evacuation from our neighborhood was lifted. With the fires still visible up the street on the hills we decided to give it one more night. I drove us back to Kenwood the next afternoon. So much had changed in the landscape and we hadn’t even gone through some of the worst areas. There was still police presence all over, even an armored car and fatigue-clad officer standing guard into one of the neighborhoods a few blocks from us. When we were reunited, there were tears and kisses, and the biggest group hug our little unit has ever had. The next day, Thursday, October 19 was my birthday. We were home. I found my keys on the coffee table. 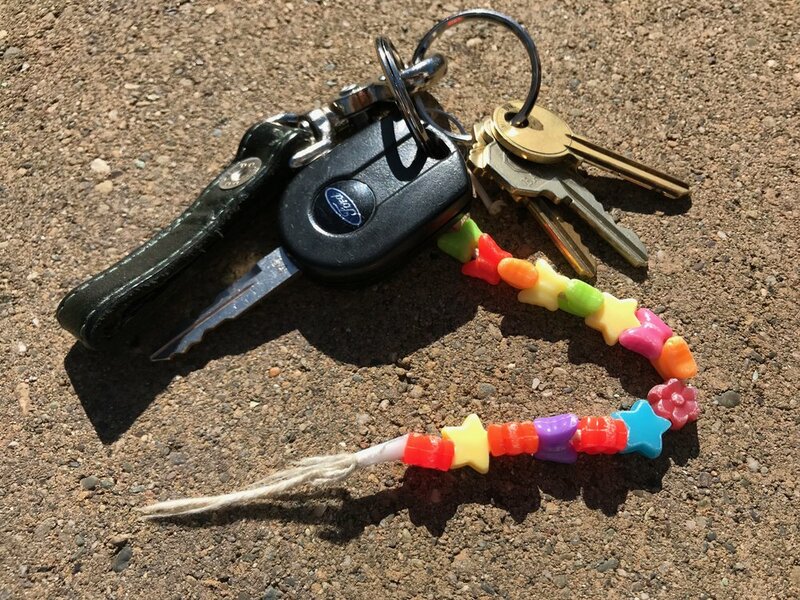 Right where Aurora had left them after she made me a new key chain. The wind was gone, and even though it was only a light sprinkling, it rained. Yes, it was St. Patrick’s Day, and yes, we try to eat less meat these days. But, when my post stomach bug daughter said, “Mommy can we have spaghetti and meatballs” and my still not feeling quite right husband replies, “that sounds good” that’s all I needed. Sometimes you just have to go for a big family-style bowl of spaghetti and meatballs with the cheese left out to add more as you twirl your way towards the bottom of the bowl. This straight-up gravy is from my friends Christine and Carla Pallotta. My guess is it is 100% Angie’s, their awesome mom, who I am lucky to have also spent some time with. The Pallotta’s have Nebo Cucina & Enoteca in Boston, an extension of their childhood kitchen and recipes. I haven’t been since they changed locations, but one day. And when I get there I will eat and eat some more! The meatballs are not theirs to a T, but pretty close. They might not approve of my changes, but hey, sometimes you have to break some rules. I add a bit of milk because my grandmother did. (No Christine, she wasn’t Italian.) And, I have a soft spot for oregano. I pretty much always use all beef even if I prefer the beef and pork combination and I use Parmigiano-Reggiano where they use Pecorino Romano. Why? Because that’s typically what I have in the house. I like and buy the organic ground beef that is 85% fat from Costco and usually have it in the freezer. I always have a hunk of Parmigiano-Reggiano in my refrigerator drawer. I can be out of almost everything else, but not the Parm. Blend the tomatoes and their juices in a food processor or blender. Heat the olive oil in a Dutch oven over medium-high heat. Add the onions and cook until translucent, about 5 minutes. Using a slotted spoon remove the onions from the oil and discard the onions or save for another use. Put all of the meatball ingredients in a large bowl and mix well with your hands. At this point, if you like things a bit tidier, you can pinch the meat into 18 portions, form all of the meatballs, putting them on a lined baking sheet as you go, and have them ready to fry. I prefer to form them right in the bowl and then start cooking them. I give them a final roll right before they go in the pan. Saves on clean up. Heat a film of oil in a large skillet. Add the meatballs and cook in batches to keep from overcrowding. Do not turn the meatballs until they are nicely browned and can easily be lifted. Repeat the cooking and turning on all sides, about 10 minutes in total. They do not have to be cooked through. Put them right in the Dutch oven with the gravy. Once the meatballs are in bring the gravy to a low simmer and cook for about 45 minutes. Add the spaghetti and cook according to the manufacturer’s instructions, about TK minutes. Usually when I cook spaghetti and most other pastas I use a big metal strainer and go right into the gravy/sauce, but that’s tough with meatballs. First, scoop out about 1 cup of pasta water, set it to the side, and then drain the spaghetti. The spaghetti goes right back in the pot, then ladle in gravy, adding a little pasta water (you won’t use it all), tossing until the spaghetti is nicely coated. Pour the spaghetti into a large family-style bowl or divide among individual bowls. Top with the remaining gravy and meatballs. Serve with the Parmigiano-Reggiano on the side. For whatever reason, cold sesame noodles always remind me of my first solo apartment in Chelsea, New York City. I am sure it has something to do with late night take-out extravaganzas from Sammy’s with friends after a little (or a lot) too much drinking. Even on those nights of less discerning tastes, I preferred the noodles that were less peanut buttery. When I started experimenting with batches myself, I noticed versions that used a Chinese sesame paste or tahini mixed with the peanut butter. I like this combination. So does my daughter. That’s why I usually leave out the sriracha. A little will give them a nice kick though. The original Microplane rasp grater is a workhorse in my kitchen. It’s terrific for grating both garlic and ginger. Unlike my 20’s when these would be matched up with scallion pancakes and dumplings, I now like these noodles paired with a simple salad of mixed greens with Sesame-Lime Vinaigrette and Sautéed Mixed Mushrooms. Bring a large pot of salted water to a boil. Fill a small bowl with ice cubes. Add the sugar snap peas to the boiling water to blanch, just to take out a bit of the raw taste, 2 to 3 minutes. Using a fine-mesh strainer or a slotted spoon, quickly scoop them out and put in the bowl of ice to stop the cooking. Dry on a towel. Put the noodles in the same boiling water and cook according to the manufacturer’s instructions, usually about 7 minutes. Meanwhile, put the garlic in a small mixing bowl. Pour over the rice wine vinegar and let sit for about 5 minutes. Strain the noodles in a colander in the sink and immediately run cold water over them, tossing them until completely cooled and separated. Shake the colander to remove excess water. Let sit while preparing the sauce. Add the ginger, sesame oil, soy sauce, tahini, and peanut butter. Whisk until smooth. The texture of the sauce needs to be loose enough to coat the noodles. Slowly whisk in the water to reach the desired consistency. Add sriracha to taste, if you like. Give the noodles another toss and put the in a large mixing bowl. Pour over about three-quarters of the sauce, tossing to coat the noodles. Add the sugar snap peas, red pepper, and the remaining sauce, and toss again. Transfer to a large serving bowl. Sprinkle with the sesame seeds and the scallions. Chop sticks are really great for serving them. With so many mixed greens available in the market, the greens can become as versatile as the usual salad toppers. And, sometimes all I want are the greens. With a bold vinaigrette like this one, I like a mix like organic girl Super Greens, that includes chards, choys, spinach, and arugula. A little vinaigrette will go along well. This vinaigrette also works well with sautéed mushrooms (See Note on Mixed Mushrooms, Below), drizzled over roasted asparagus, or mixed with buckwheat soba noodles as part of a one bowl meal. Put the shallot in a small mason jar. Pour over the lime juice and rice wine vinegar. Let sit for 15 minutes. Add the honey, sesame oil, neutral oil, and soy sauce. Secure the lid and shake. I love mixed mushrooms, sautéed to be crispy on the outside, with a good chewy texture. And, like greens, there are some great mixes available that also can prove less expensive than buying all of the individual varieties. The other day, I bought two 8-ounce packages of Mycopia Chef’s Sampler and 4 ounces fresh shiitakes. The secret to cooking mushrooms is to trim stems, cut, and cook by variety. What do I mean by this? Take your sampler pack and separate by varieties. Trim and then cut all of the trumpets the same size and put them in a pile. Repeat with the clamshells and any other varieties, making a separate pile for each. Set the trimmings aside if you think you’ll be making a stock. Lastly, remove the stems from the shiitakes and save for the stock or discard. Cut the tops and put them in their own pile. Remove the pan from the heat. Using a slotted spoon, transfer the mushrooms to a baking sheet or plate. Wipe out the pan and add and heat oil again, as needed. Repeat one variety at a time until all of the mushrooms are cooked. Transfer the sautéed mushrooms to a bowl or storage container and spoon over the sesame lime vinaigrette. For two 8-ounce packages and 4 ounces of shiitake, I used 2 tablespoons. Keep in mind, as the dressed mushrooms sit, they will soak up the flavor. Garnish with toasted sesame seeds and/or thinly sliced scallions, if you like. I think the tang of this vinaigrette is best with a crisper lettuce, like romaine. Or better yet, with a mix of romaine and some thinly sliced cabbage, like in my Almost Any Time of Year Crisp Salad. Using a Microplane, grate the garlic into a small mason jar. Pour over the lime juice. Let sit for 15 minutes. Add the ground coriander, brown sugar, and oil. Secure the lid and shake. Add the chopped cilantro and shake again. I am definitely someone who likes to eat in season, but can’t go all winter without a really ample bright salad with a lot of crunch. This one works pretty much year round with the hothouse varieties of some vegetables available. The only tomatoes I will even consider buying in the winter are the small grape or cherry varieties. Nothing like their summer cousins, but definitely will do. The same goes for cucumbers. That’s why this is a perfect weeknight salad topped with Crispy Oven-Roasted Chickpeas pretty much any time. That is, if I plan ahead and buy all of the vegetables I like. If something is missing, no big deal, it’s the Cilantro Lime Vinaigrette that is really the key. Inevitably there is the question of what to do with leftover cabbage. I know you can buy already prepped and shredded cabbage. And, if you like it, go for it. But, I find I do fine if I ask someone in the produce department to cut the cabbages and the jicama in half. Thinly slice some or all of the leftovers, add in some carrots and radishes, and toss with some vinaigrette for a crunchy slaw. Use it on top of beans, vegetables, fish or meat in a soft tortilla for tacos later in the week. Remove and discard any tough outer leaves from the romaine. Tear or cut the remaining head into 1-inch strips. Put in a large bowl. Add the green and red cabbage, carrot, radishes, cucumber, red onion, and jicama, if using. Drizzle ¼ cup of the vinaigrette along the inside edges of the bowl. Gently toss all of the ingredients to combine and lightly coat the vegetables in the vinaigrette. Season to taste with salt and pepper and additional vinaigrette. Serve family-style or divide among plates. Sprinkle the chickpeas over the top and add cilantro leaves, if you like. Timing does not need to be perfect to pull off this dish. In fact, I often have some or all of the parts made ahead of time. This is a good one for me to have ready to go on a night when I drive my daughter to a lesson. Particularly if it’s swim class, I have a 10-minute window from the time we get home before her mood goes completely south! · Toast the pine nuts on a baking sheet in a 325˚F oven, until golden brown, about 5 minutes. Transfer to a bowl. Increase the oven temperature to 400˚F and make the Crispy Oven-Roasted Chickpeas. Loosen them with a spatula, and leave on the baking sheet. They’ll be more chewy than crunchy, but still delicious. · Cook the orecchiette and drain in a colander, reserving about 1 cup of pasta water. Rinse under cold water until completely cooled. Line a baking sheet with a towel and pour them out on it and cover with another towel. I used to really dislike recipes that called for 12 ounces of dried pasta, but now I sort of do it on purpose. I will always cook the full pound knowing I will have some leftover. Usually it ends up in soup. · Cook the kale and keep in the sauté pan. Cut up the roasted peppers and add to the pan. Give a quick reheat when you get home and pick up the instructions below where the pasta is added. You might need to add a bit more liquid as you reheat. Heat a film of oil in a large sauté pan (with a lid, you’ll need it later) over medium heat. Stir in the onion and garlic and cook, stirring often, until the onions are a light golden brown, 6 to 8 minutes. Add the kale and water. Cover the pan and lower the heat to medium-low. Let the kale steam, stirring once or twice, until beginning to soften, about 5 minutes. Remove the lid and continue to cook until the kale is completely tender, up to 10 minutes more. If the pan begins to dry out, add a little more water, about a tablespoon at a time, and continue to cook until the kale is tender. While the kale is cooking, add the orecchiette to the boiling water and cook according to the manufacturer’s instructions, about 11 minutes. Remove the garlic cloves from the kale. Stir in the vinegar and season to taste with salt and pepper. Add the roasted pepper strips. Drain the pasta, reserving about 1 cup of the pasta water. Add the pasta to the kale mixture, stirring to incorporate. Add pasta water a little at a time to thicken the mixture as you are stirring. (You won’t use it all.) Depending on my mood, I might use a Microplane to add about ¼ cup grated Parmigiano-Reggiano at this point. Season to taste with salt and pepper. Stir in the toasted pine nuts. Serve family-style or divide among bowls. Top with the crunchy chickpeas. Using a wide vegetable peeler, peel shavings of the Parmigiano-Reggiano over the top, if using. My daughter's portion. And, she ate the whole thing! These are fast, easy, and super adaptable. True, they make a terrific snack on their own, but I really like them with other things, like a bowl of pasta, a freshly tossed salad, or even on top of a chili or thick soup. I think these are best when warm and crunchy, but definitely still tasty if made ahead. They will be chewier as they cool. When choosing the spice or herbs, think about what you are eating them with (suggestions below). Salt and any ground spices should be tossed on before roasting and any freshly chopped herbs after. The fresh herbs will want to fall off, but I still like using them for the color and bright taste they add. If I am putting the chickpeas in a bowl for a snack, I’ll usually wait and sprinkle the herbs on after they are in the bowl. Peeling chickpeas takes a little extra time, but with this hazelnut-like method you will have a better end result. This recipe easily doubles for a larger batch. Pour the chickpeas in a fine-mesh strainer and rinse under cold water. Shake the strainer to drain. 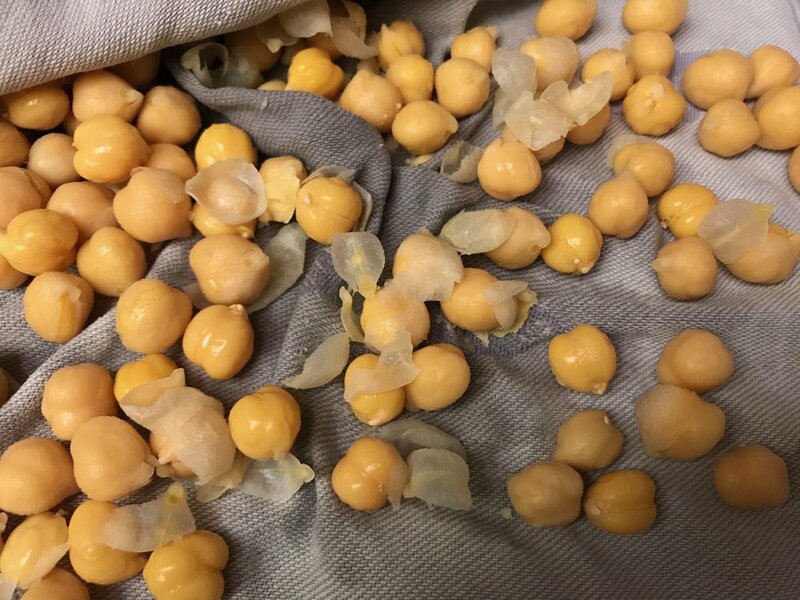 Spread the chickpeas on a clean towel, fold over the towel, and lightly roll around between the layers to dry the chickpeas and remove their skins (see photo below). Pick out and discard the skins. Transfer the chickpeas to the bowl, removing any remaining skins, leaving any on that are too tough to remove. Put the chickpeas in a bowl large enough to toss them. Drizzle with the oil, followed by the salt, then the spices to taste (err on the side of less). Toss or stir to evenly coat. Spread on a small baking sheet. (They will fit on a quarter sheet pan which measures 9-by 13-inches.) Roast, until crisp and dry, 20 to 25 minutes, shaking the pan every 10 minutes. Remove from the oven and sprinkle with any fresh herbs, if using. Shake the pan to evenly distribute. Transfer to a serving bowl for snacking or use in the recipe or your choice. Not sure why I always seem to want to bake in February with my daughter, Aurora. Sure we make cookies around the holidays, but there is something about the post holiday, settling into winter, when I am definitely ready to grab a few cookies. Usually I justify them after a run with a second or third cup of coffee. This recipe has played a bit of telephone tag over the years. I made it for the first time when I worked on Robert Steinberg’s and John Scharffenberger’s The Essence of Chocolate (Hyperion, 2006). The recipe, Chocolate Chunk Cookies came from Joanne Chang, chef and owner of the Flour Bakery and Cafe in Boston. She used two kinds of chocolate. For years I stuck along the same lines, and gratefully reflect on an article Diane Peterson wrote about me in The Press Democrat, February 24, 2015. I used larger chips like the Guittard or Ghirardelli semi-sweet and put in big hunks of walnuts for my husband. When my daughter got to cookie helping and eating age, I only made half with walnuts. Then one day when I thought I had chocolate chips and I didn’t, I tossed in the end of a bag of trail mix. With subsequent batches, I thought why not make everyone happy, divide it and make a little bit of dough with what everyone likes. Do you like flatter, crisper cookies or thicker softer-centered cookies? This recipe can give you both. See method. Position the oven racks in the lower and upper thirds of the oven and preheat to 350˚F. If you have an oven with a convection setting, use 325˚F convection. Line two baking sheets with parchment paper or silicone baking mats. In a medium bowl, whisk together the all-purpose and bread flours, the baking soda, and salt. In the bowl of a stand mixer fitted with paddle attachment, cream together the butter and both sugars on medium speed until pale, light and fluffy, 5 to 7 minutes. Scrape down the sides and bottom of the bowl. Add the eggs and vanilla and beat until just combined. (Over mixing at this point can deflate the dough later.) Scrape down the bowl. Turn off the mixer and add the combined dry ingredients. Pulse and mix on the lowest speed to start to incorporate and keep the flour from flying out of the bowl. Then mix on low, just until the flour is blended, 2 to 3 minutes. Remove the bowl from the mixer, divide as needed, and fold in the add-ons. Personally, I like to use a small ice cream scoop for more uniform cookies. And I find the scoop makes it much tidier to work with. Scooping is also a great way to prep for freezing to have cookie dough on hand, see below. If you like cookies that are thinner and a bit crisper, you can scoop and bake while the dough is still soft. Or refrigerate for up to 3 days. Drop the dough a scoop at a time, about 2 inches apart onto the prepared pans. If the dough has been refrigerated, flatten slightly and let the dough warm up for about 20 minutes or so before baking. If you prefer cookies that are a little thicker, with a slightly softer inside, I suggest refrigerating the dough until cold, at least 2 hours, but preferably overnight (or up to 3 days). Drop the dough a scoop at a time, about 2 inches apart onto the prepared pans, flatten slightly, and bake. If making ahead (or a larger batch as I often do), drop a scoop at a time, about ½ inch apart and fill up the pan. Cover the top of the pan with plastic wrap and freeze until solid. Transfer each kind to its own resealable plastic bag or airtight container and return to the freezer. Be sure to label them. A raisin can look a lot like a chocolate chip when frozen. Bake until golden, rotating the pans halfway through baking, about 15 minutes depending on how cold the dough is. Transfer the cookies with a spatula to a cooling rack to cool completely.